A leading commercial subcontractor in the electrical, structural steel and roofing market segments in northeast Ohio had been in business for more than 80 years and had been with the same bank for more than 40 years. The Company’s original bank had gone through several mergers and acquisitions and was now part of a much larger institution. The Company found that it was no longer a fit for the bank’s definition of a target customer. The Company had been seeking a new banking relationship on its own but was not satisfied with the progress it was making. After being introduced to the Company, Concord quickly determined that the Company’s core business was strong, under solid management and would be an attractive client for any number of financial institutions. Concord created a detailed memorandum featuring the Company’s strong management team, competitive strengths in its market and highlighted the plan to maintain and grow core profitability and cash flow. Concord drew on its 14 years of experience to identify a number of financial institutions that were comfortable with the subcontracting space, typically a difficult segment in which to lend. 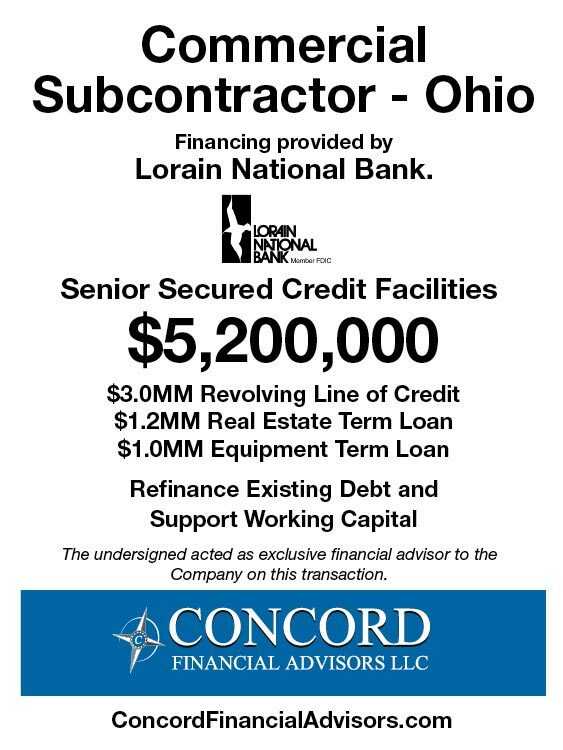 After conducting a targeted search process generated multiple Term Sheets, Concord secured a financing arrangement from Lorain National Bank, a local community bank covering all of northeast Ohio, which met the Company’s objectives and closed the deal in December.